Oregano (Origanum vulgare) is a popular fresh and dried spice used in Greek and Italian cooking. The flowering plant is a member of the mint (Apiaceae) family and is closely related to marjoram, thyme, basil, sage, and lavender. Cooks use either fresh oregano or they add it to recipes in dried or ground form. The spice has a warm taste that some also describe as bitter, musty, or minty. Oregano and oregano oil benefits have been widely studied by researchers. Both oregano and oregano oil are used for medicinal purposes. Scientists are also investigating the way that oregano may be able to play a role in breast cancer treatment, but research is in the very early stages. You should note that, currently, there is not enough evidence to support any of these medicinal oregano or oregano oil benefits. There is some evidence that suggests oregano oil may help treat intestinal parasites in humans. In another study, researchers have also found that an oregano extract ointment may help surgical wounds better than petroleum jelly. Further studies are needed to confirm either of these health benefits of oregano. 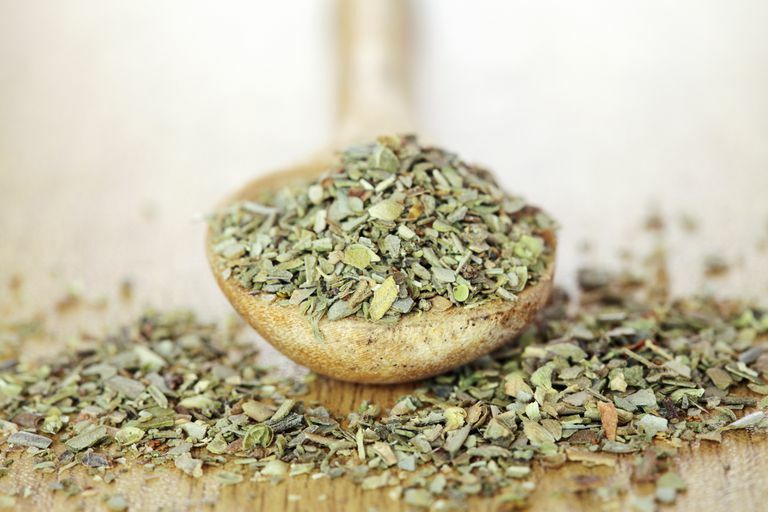 Lastly, oregano is one of several ingredients in Zyflamend, a supplement that claims to boost your immune response, heart health, and joint function. Some preliminary studies have suggested that the supplement may have some benefits, but more research is needed. There are almost no calories in oregano. According to USDA data, 1 teaspoon of ground oregano provides approximately 5 calories and 1 teaspoon of oregano leaves provides only 3 calories. Most of the calories come from carbohydrate in the form of fiber, but oregano is not a good source of fiber. A teaspoon of oregano leaves will help boost your vitamin K intake, providing about 14 percent of your recommended daily intake. You'll also benefit from a boost in vitamin A (2 percent of your recommended daily intake), vitamin C (1 percent), Vitamin E (2 percent) folate, niacin and vitamin B6 (1 percent each). Minerals in oregano include calcium (27.6 mg), iron (0.8 mg), magnesium (4.7 mg), phosphorus (3.5 mg), potassium (29.2 mg), sodium (0.3 mg), manganese (0.1), and small amounts of zinc, and copper. Oregano in most forms is easily found in most grocery stores. You'll find ground and dried oregano in the spice aisle. These spices should be stored in a cool, dark, dry space such as a cupboard or cabinet that is away from the stove. Fresh oregano is found in the produce section. Look for bright green, healthy leaves. Once home, wrap the oregano in a paper towel and store in the refrigerator until you are ready to use it. You can use fresh, ground, or dried oregano leaves in many Italian and Greek dishes. It is popular as an ingredient in spaghetti sauce and pizza. Try any of the following recipes with oregano. Oregano or oregano oil are safe for most people when used in amounts typically found in food. However, those with allergies to mint (or other plants in the mint family) may experience an allergic reaction when they consume oregano. When used for medicinal purposes, oregano is possibly safe when taken by mouth or applied to the skin, although some people experience stomach discomfort. Health experts caution that skin irritation may occur if oregano oil is applied to the skin in concentrations greater than 1 percent. It is unknown if using oregano or oregano oil medicinally is safe for pregnant or breastfeeding women. Experts advise that if you are pregnant, stay on the safe side and avoid use. Also, people with diabetes, bleeding disorders, or who will be undergoing surgery within two weeks should speak to their healthcare provider before using oregano. Are there different types of oregano? Yes, you might see Turkish, Greek, or Italian oregano at your market. Each type of oregano has a different look and a different taste. What is a suitable oregano substitute in recipes? Oregano is often called oregano "wild marjoram" because it has a similar taste. For that reason, you can use marjoram as an oregano substitute, but oregano is stronger, so you may need to use a bit more, depending on the recipe. Oregano Full Monograph. Natural Medicines Comprehensive Database. 08/15/2018. Zyflamend. Memorial Sloan Kettering Cancer Center. About Herbs, Botanicals, and Other Products. September 19, 2018. Vallverdú-Queralt, A., Regueiro, J., Martínez-Huélamo, M., Rinaldi Alvarenga, J. F., Leal, L. N., & Lamuela-Raventos, R. M. (2014). A comprehensive study on the phenolic profile of widely used culinary herbs and spices: Rosemary, thyme, oregano, cinnamon, cumin and bay. Food Chemistry, 154, 299–307. DOI: 10.1016/j.foodchem.2013.12.106. Rodriguez-Garcia, I., Silva-Espinoza, B. A., Ortega-Ramirez, L. A., Leyva, J. M., Siddiqui, M. W., Cruz-Valenzuela, M. R., … Ayala-Zavala, J. F. (2015). Oregano Essential Oil as an Antimicrobial and Antioxidant Additive in Food Products. Critical Reviews in Food Science and Nutrition, 56(10), 1717–1727. DOI: 10.1080/10408398.2013.800832. Al Dhaheri, Y., Attoub, S., Arafat, K., AbuQamar, S., Viallet, J., Saleh, A., … Iratni, R. (2013). Anti-Metastatic and Anti-Tumor Growth Effects of Origanum majorana on Highly Metastatic Human Breast Cancer Cells: Inhibition of NFκB Signaling and Reduction of Nitric Oxide Production. PLoS ONE, 8(7), e68808. DOI: 10.1371/journal.pone.0068808. Force M, Sparks WS, Ronzio RA. Inhibition of enteric parasites by emulsified oil of oregano in vivo. Phytother Res. 2000;14(3):213-4. DOI: 10.1002/(sici)1099-1573(200005)14:3%3C213::aid-ptr583%3E3.3.co;2-l.
Ragi J, Pappert A, Rao B, Havkin-frenkel D, Milgraum S. Oregano extract ointment for wound healing: a randomized, double-blind, petrolatum-controlled study evaluating efficacy. J Drugs Dermatol. 2011;10(10):1168-72.